We set off from York on April 1st, and boarded the ferry from Hull that evening. We rolled onto the ferry as the last passengers, but with plenty of time to spare, and arrived 12 hours later in Rotterdam. Having set off with the impression that Holland was some kind of cycling nirvana, the notion was swiftly disabused as we pedalled through miles of nondescript beige countryside. Ready to battle the wind, looking like WMD inspectors. Morale remains high, despite the tortuous effort required to reach Rob’s Aunt’s house in Ratingen, near Dusseldorf. The plan had been to complete this journey at a fairly leisurely pace, within three days. 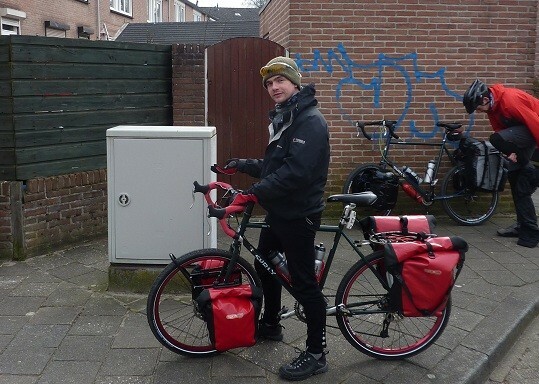 However, an icy easterly wind and problems navigating the labyrinthine network of Dutch cycle paths slowed our progress greatly. Holland may be flat, but the terrain offers little protection, or even inspiration, for cyclists who are battling a constant, and fearsome, headwind. Unsurprisingly, our overall impression of The Netherlands was not that positive. When asked to describe it in one word, the suggestions were ‘dull’, ‘monotonous’, and ‘grey’. That says it all, really. On top of this, the temperatures, with wind chill, have been incredibly low. One morning, we even woke up to discover ice on the inside of the tent. Despite all this, we arrived in Ratingen on time, following a mammoth effort on the final day. Enjoying a rest in the shelter of some trees. Fortunately, although the weather remains fairly severe, the worst should be behind us. We are taking a day to recuperate and run a few errands at Rob’s Aunt’s house (Thanks again, Sue! ), before continuing in a more south-easterly direction, towards Austria. To see where we have been and where our route intends to take us, check out the Route page. Josh next to the most interesting thing in Holland. You omitted to mention the mechanical mishap at 3 miles from home! Well at least Josh’s pedals stayed on throughout Holland. Or did they? Yeah, I didn’t want to embarrass Josh ‘pass the buck on’ Chappell. Thanks rick shame we didn’t catch you for a quick beer before we left! Will have to bore you when we get back! Good to see you underway and making progress. Stay safe gents. Cheers bud. I know what you mean Andy had control over the keyboard and got carried away. All is well so far just hope it warms up. Wish you could enjoy seen fine German beers with us! Sounds as though the Dusseldorf pit stop was very welcome. Good luck with your next stage and we’ll be hoping that the weather warms up for you.